CHCH-TV is going back to it’s roots with a new logo that will premiere in September with a slightly revamped lineup. The logo, which looks good and is almost perfect, takes the CHCH logo back to it’s roots. 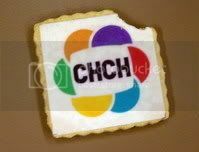 If you look back to the original CHCH-TV logo from the 1960s, it is very similar to the new logo. The only real difference between the old and the new is what is in the centre of the logo: the call letters CHCH in the new one and the number ’11’ in the classic logo. So why has Channel Zero chosen to change the logo? I think that when Channel Zero originally bought the station from Canwest last year there wasn’t sufficient time to invest in rebranding. The station simply adopted the logo and branding of the CHCH News portion of the station’s identity. I think this new ‘retro’ logo will do a lot in inviting people back to the station who might have abandoned it in the E! days. So the moniker News and Movies will expand to “News, Movies & More” in the fall when Hollywood television shows return to the station. Shows that have been listed to air this fall include Smallville, Supernatural, Chuck, Jimmy Kimmel and Everybody Hates Chris. New local sports program Sportsline will also air with Mark Hebshcher as host. While there will certainly be more shows, not much more has been revealed. Also newsmagazine shows will be added to the lineup to compliment the news format of the station. News programs 20/20, 48 Hours Mystery, Nightline and 60 Minutes join the station. Some of these shows are coming from Sun TV, which is being rebranded as Sun News (pretty much a Canadian take on Fox New Channel). I haven’t seen anything regarding a schedule grid for the station but with movies continuing in the lineup it remains to be seen if the movies will air every night or only on a few nights. What do you think of the new logo and the direction of the station?